Where have I been? I’ve been planning and printing for Springtime in Paris. After I got that first partial row of Springtime in Paris done, I realized I really wanted to plan this one out a bit more carefully. So I printed out one of the worksheet pages from the Inklingo Orange Peel Deluxe collection and sat down with a pen and started planning. And planning. And I am not showing the sheet with my eighty gazillion completely illegible notations as they’d mean nothing to anyone but me and, in fact, only would mean something to me if I read them within 24 hours of making them. Hmm — that really begs the question. Why do I make so many obscure notations? Do I think the cats are going to read them and hide one piece of fabric that helps make this work? Once the planning was all done, I then got down to figuring out exactly what other shapes I needed to print on the fabrics to make my design idea work. And print I did. A few more peels and lots of half peels, squares and towers. And within less than half an hour I had everything printed I need to make this quilt that I know I’m going to absolutely love. There’s only a small representative stack of the towers in this picture. There are many, many, many more. The beginning – the top left-hand corner of Springtime in Paris. Once I get the first couple of rows done, the row that I began stitching last week will be added in. The whole thing is planned out. And my sheet with all my notations and markings is now tucked safely away. Mr. Q.O. even offered to go get it laminated after hearing me muttering about where I could put it to make sure it would be safe from kitties. Then I started stitching towers to squares. And now for the part that makes this extra appealing to me. A project box that I’ve decided looks like a wonderful French hat box for all the pieces of Springtime in Paris (and yes, there are still more towers to be added to the box). I just had to show yet another picture of the pieces in the hat box — see how perfectly the peels and half peels just nestle right in the curves of it? It was meant for this project! Now it is going to be just nothing but lots and lots of wonderful stitching – and all of it is either continuous stitching (attaching the towers to a square) or continuous curved piecing (attaching peels to the towers). Which brings me to another question. So far I’ve made Chintz Circles, X’s and O’s and now Springtime in Paris using shapes from the Orange Peel collection. And I know, without a shadow of a doubt, that there are at least two more quilts in my future using shapes in that collection. I wonder, what is it about the shapes in this particular collection that I find so irresistible? 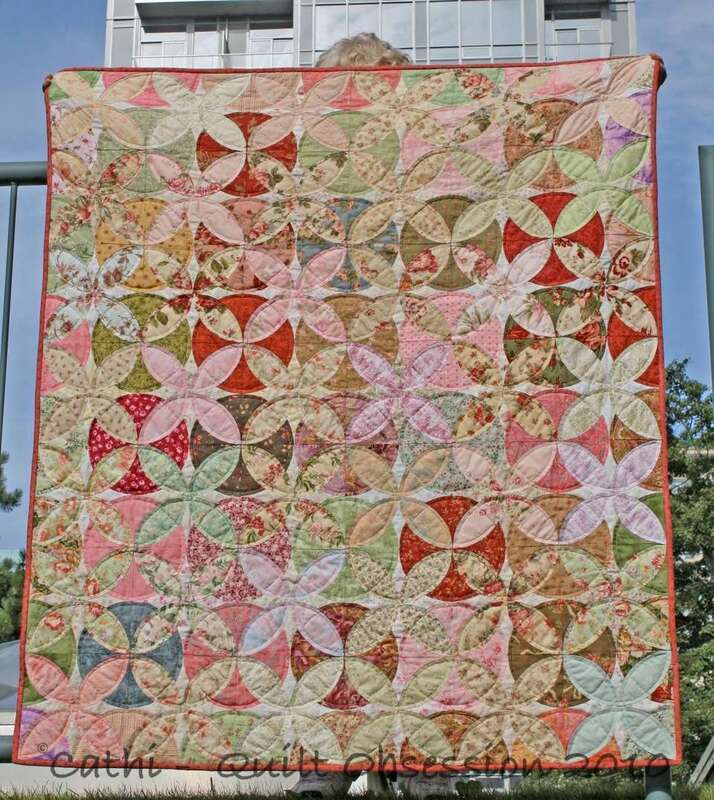 And why do the quilts I make using that collection seem to almost stitch themselves? They go together so easily that I almost have to tell myself to slow down so I can enjoy the process for a longer time! Mr. Q.O. has been getting some great photos of the kitties. First this one of Jake. And then this one of Baxter. Wish I could pick your brain and have a class with you. 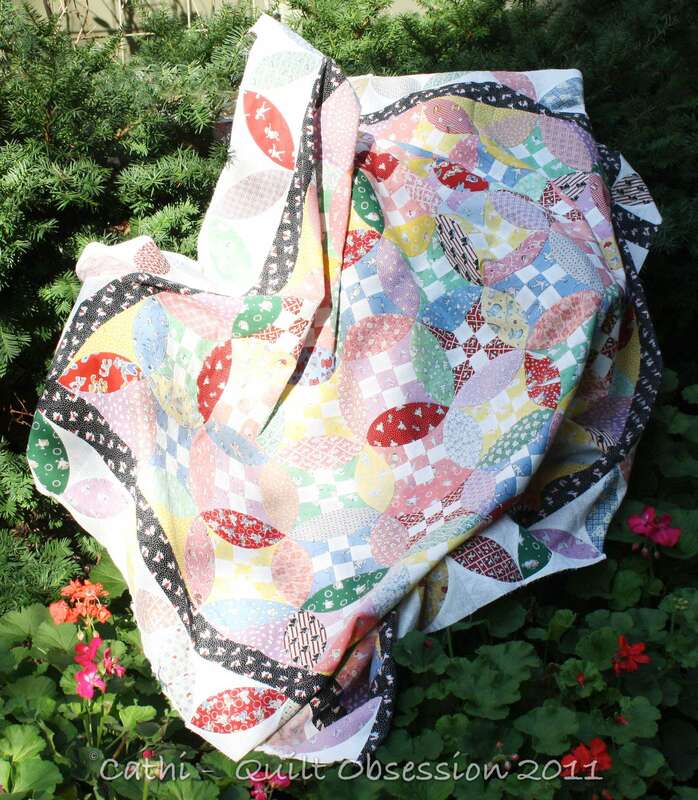 I think your colors are so beautiful for each quilt that it is exciting and a pleasure to stitch them together. Perhaps the fisherman has had a tad to much wine and doesn’t realize there are others that want to join him. Have a great time stitching. That dark pink just put the zing into those patches, nice! You’ll whip this one out in no time! Ahhhhhh…..memories of hat boxes and dollar stores in Toronto….. what fun! Lovely shades with a pink to lift it for contrast, I can see the planning has been so worthwhile, and notes, others call them scribble, but I do that too, not for quilting, but when trying to puzzle out a complicated crossword. Love the last photo, super background, Baxter is saying ” What next” and Jake” I’m so happy here”. Cheers, Jean. Love the fabric you’ve chosen, how big are you going to make this one? Is it going to be bed sized?